My experience is that salespeople spend a lot of time wondering, “Am I spending my time on what’s most likely to result in closing more business?” They’re rightfully worried about closing deals, but there’s nagging doubt along the way about whether the path they’re taking to that goal is the straightest one. You’ve probably seen what happens when this kind of thing doesn’t happen. 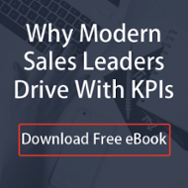 There’s a month where your team is crushing its numbers, your sales manager is thumping his or her chest at the whiteboard, and everyone buys a couple extra dozen cookies from their neighborhood Girl Scout because of all the money they’re going to soak in. (“Why yes, I would like Samoa.”) Among the euphoria, everyone stops prospecting, moving deals forward and otherwise focusing on the process, and then you’re blindsided by the arctic numbers that drop the next month. What are the three or four controllable behaviors happening day in and day out that should lead to more business? A couple important distinctions here. “Controllable” does not mean things you can force your sales team to do by threatening them with wet willies. It’s referring to activities that they can control with their effort regardless of any other variable. And “should” (rather than “will”) acknowledges the fact that while the convergence of factors leading to a deal closing (or not) may progress beyond your salesperson’s reach, their contribution at key, established points in the pipeline is what will make them so valuable to your process. Activity Based Selling is a new theory in the sense that we are seeing more and more companies managing their high-growth teams in this way, and our technology makes it so much more possible to do that effectively. The nebulous old days of relationships being quantified via steak dinners have been overthrown by data-driven sales teams keeping track of what we’re doing and why it matters. Activity Based Selling then requires you as a manager to make those behaviors part of your conversations individually and with your staff – pats on the back to encourage those finding success to share “The Moments” that keyed their wins, or offering to help remove roadblocks for those struggling to get on track. Many managers have plugged their ears by now, preferring the age-old standby question of, “What’s closing this month?” To them, I’d say: Your people are already making these decisions about their time each day, but they’re doing it without you. You can improve both of your situations by getting in that process with them. We’ll take a look at other applications of Activity Based Selling here soon. What activities do you rally your sales team around? More and more sales leaders are talking about "Activity Based Selling" – here's what it means and why you need it.